Today is Vishu - Kerala New Year. In the state that is popularly known as �God�s Own Country�, the start of the Zodiac New Year, when the Sun enters into Ashwini star, is celebrated as Vishu. The day is celebrated with great pomp and joy and it is believed that the first sight of the morning is an indication of the prospect for the whole of the new year and hence the significance of auspicious sight or Vishukkani� Over the years, devotees from the state had the unparalleled celestial boon of celebrating the New Year in the holy precincts of Prasanthi Nilayam, with Bhagawan amidst them, granting mighty the heavenly �auspicious sight�, Divine Darshan! Hundreds of devotees from the state have turned up this year also and in the auspicious morning the Mandir precincts wore typical Kerala decorations. Celebrating the occasion there will be a special session in the evening that commences at 1700 hrs., after half-an-hour Veda chanting, with a speech by Sri KR Jyothilal, IAS, which will be followed by a Musical offering by famous Carnatic Vocalist Dr. Sirkazhi G. Sivachidambaram. Live Video WebCast of the proceedings begins at 1700 hrs. and will be available at Radio Sai website. Painting holy Vishu with devotional hues noted Carnatic vocalist Padmasri Sirkazhi Sivachidambaram presented a musical offering this evening in Prasanthi Nilayam. Beginning with a slow-tuned invocation, Gurur Brahma, the singer set the ball rolling with a Ganesh Stuthi followed by an array of keertans. Earlier the programme commenced at 1700 hrs. with Rudram chanting by students. Prof. Mukundan, State President of Sri Sathya Sai Seva Organisations � Kerala introduced the speaker for the evening, Sri Jyothilal, IAS, Secretary, General Administration to Govt. of Kerala before briefing about ensuing the musical programme. In his short speech Sri Jyothilal elucidated on Bhagawan and His Divine Glory. At the end of the session, the artist and accompanists were felicitated by senior officials from SSSSO � Kerala. 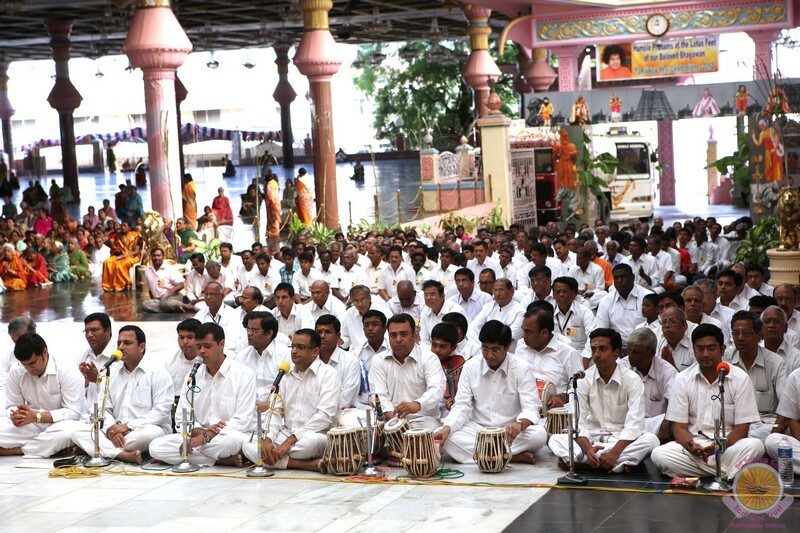 Bhajans continued for sometime and Prasadam was distributed to the entire assembly. Mangala Arathi was offered at 1900 hrs. Joining regular devotees, hundreds of youth also have come to Prasanthi this time to celebrate the holy occasion in the Divine Presence. 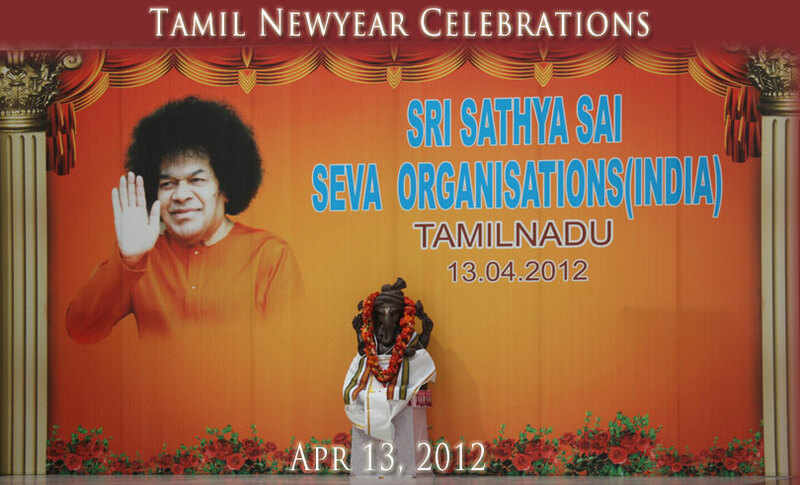 It was a very special Tamil New Year in Prasanthi Nilayam. 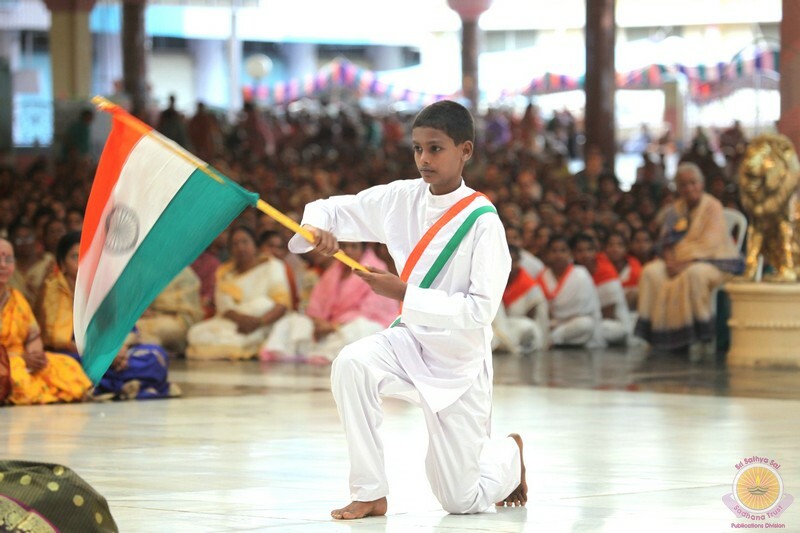 Hearing and Speech Impaired Children from Vela School, Villipurum captured all hearts in Prasanthi Nilayam with a scintillating dance performance in the Divine Presence entitled, �Dikku Leni Vaariki Devude Gathi!�. The school is adopted by Alumni of Sri Sathya Sai Institute of Higher Learning and the Sri Sathya Sai Seva Organisation, Tamil Nadu. The songs were played only for our benefit. These children cannot hear the song or match their steps with the beats of the song. Yet, they have been taught these dance steps by their teachers using only hand sign language, eyes and facial expressions. The dance was orchestrated live by their teachers seated in front of them using this noble communication. This cultural presentation was followed by seven melodious songs in various languages by the famous Sundaram Bhajan Group to indicate how all distinctions melt away and amplify harmoniously in His Divine Presence. All participants were honoured with clothes. Also special gifts with Baba�s blessings was distributed to all the children from the school who had assembled in the Sai Kulwant Hall. Earlier in the day, the Tamil Nadu Devotees and Youth conducted the morning session in Sai Kulwant Hall rendering both Vedam and Bhajans between 0800 to 0930hrs. Prasadam was distributed to the assembly both in the morning and evening.